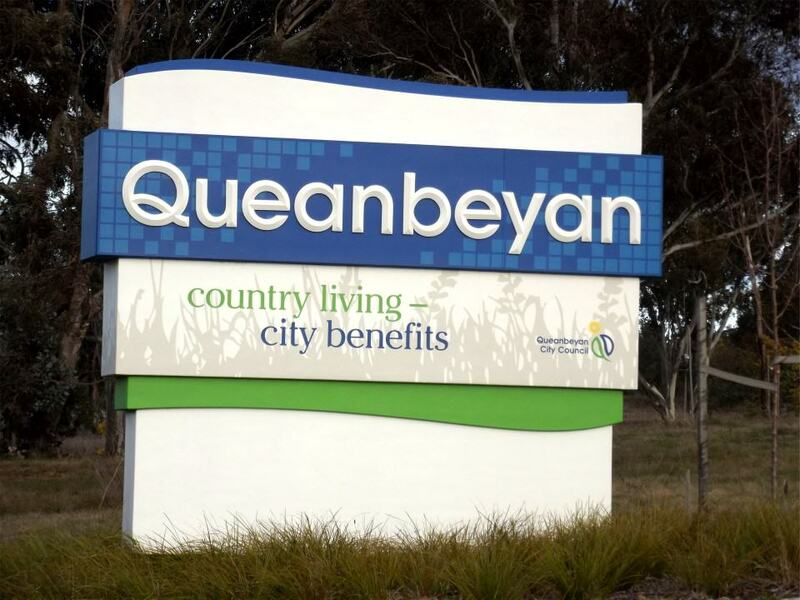 Queanbeyan, on the border of the Australian Capital Territory, has been described as country living with city benefits and is somewhere I’d always wanted to visit. 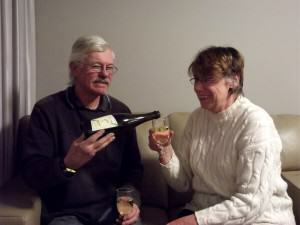 So, when John told me that he had to go to Canberra and would be staying in Queanbeyan,well you couldn’t have kept me away with a stick! We arrived in the late afternoon of a late-winter’s day and settled into out chosen accommodation, The Queensgate Motel ([star][star][star][star]), before heading off to do a little exploring. First stop was, of course, the Visitor Information Centre. 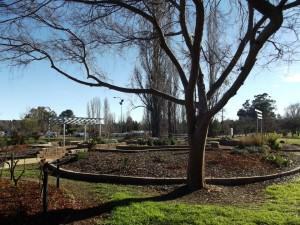 These information centres are marvelous; they have a wealth of information on the locality and surrounding areas and we’ve always found the staff helpful and friendly. And so, armed with brochures and maps, we wandered out to the front of the Centre which is housed in a Heritage building. Built in 1925 for the Municipal Council, it remained a Council building until 1975. By now it was getting pretty late and so we made our way back to the motel for our first night bubbly with Two Tails Sparkling Wine but first we made a quick stop by the Queanbeyan River where we watched the wild ducks and geese. 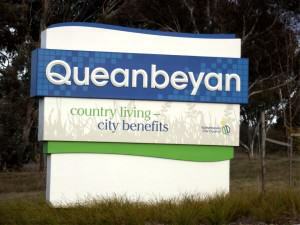 The name “Queanbeyan” comes from the Aboriginal “quinbean” which means clear waters and I wanted to see if the river lived up to that. I’m happy to report that I wasn’t disappointed. 50, today there are over 40,000 people living here. Gold was discovered in 1851 and that, naturally, attracted bushrangers including Frank Gardiner and Ben Hall, two of our more notorious outlaws. 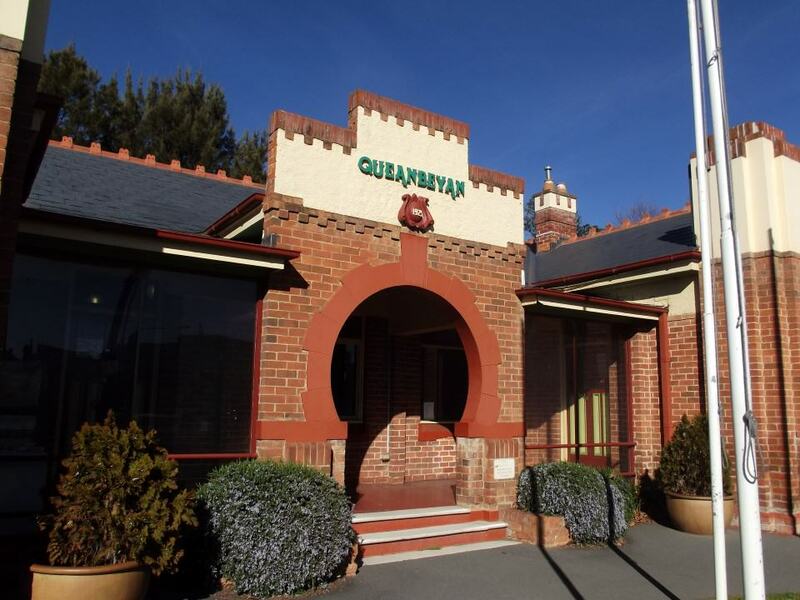 Today Queanbeyan is a major regional centre in the New South Wales Southern Highlands and has a strong sporting culture. 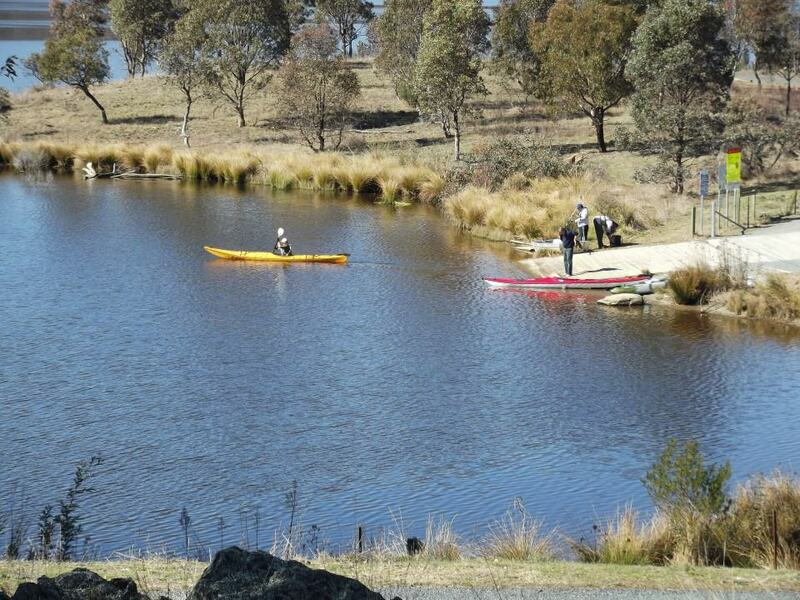 It is the birthplace of some of Australia’s sporting legends including Rugby Union’s David Campese, Formula 1 driver Mark Webber, and Test Cricketer Brad Haddin. because it has continuous flow all year round. 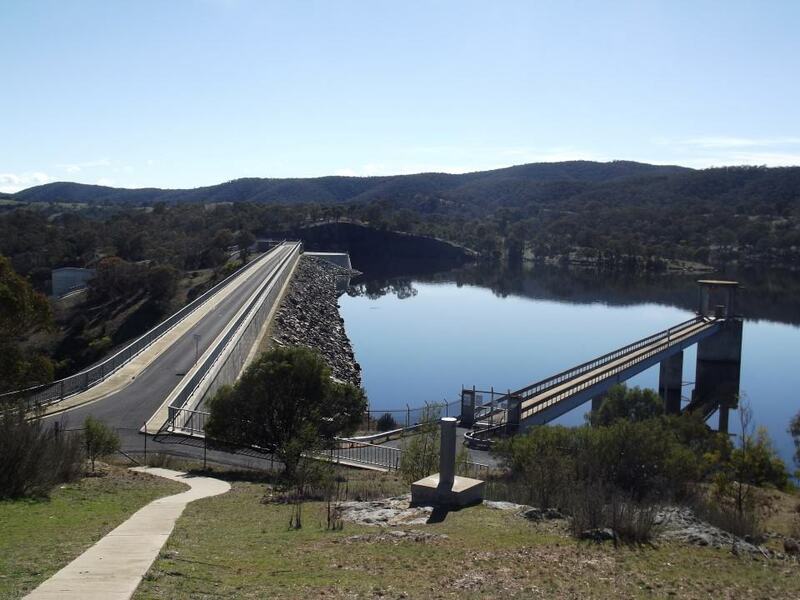 The weir was constructed in 1901 and even though it is used for minor irrigation requirements it is somewhat controversial as it has had a serious impact on the fish population. impressions of local plants, and still more have images on them. It’s really quite fascinating. There’s only so long you can walk around a garden and before too long we were off for a much-needed cup of coffee to warm us on this frosty winter’s morning. We stopped at the Riverside Café situated, as the name suggests, beside the river. We sat outside on the off-chance that we might see some of the native wildlife. The river, itself, is home to a platypus colony and also native water rats but I guess they were being shy on this day because we didn’t see any at all. Nor did we see any of the many Eastern Grey kangaroos that are said to frequent the riverbank. But we did see where they had been and had to be careful where we walked! John, as usual, struck up a conversation with some other folks in the café. I swear, even in a silent order of monks that man would find someone to talk to! One of these people imparted the (unwelcome?) information that fishing is permitted in the river. Oh joy. However, the pastime is discouraged to protect the platypus population. After our coffee break we strolled along the main street heading back towards the Information Centre. Directly opposite the Centre is Queanbeyan Courthouse but it wasn’t the courthouse itself that captured our attention, it was the bronze statue standing on the corner of the street. John Gale (1831-1929) is called the “Father of Canberra”. 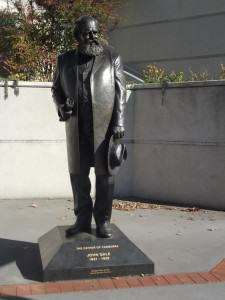 He was a newspaper journalist and founder of the first newspaper in the region, The Queanbeyan Age. The Age is still in circulation today. 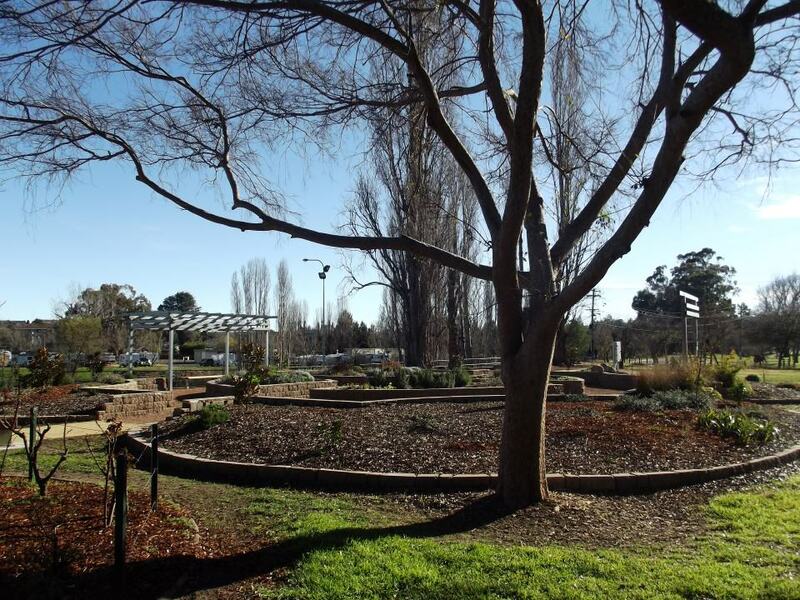 But he’s mostly remembered as a strong advocate of Canberra as the best site for Australia’s capital. original bridge was built in 1901 to replace the stepping stones that had been used to cross the river. I can imagine there were a lot of wet feet, at the very least, in those days! Not to mention the odd inebriated fellow going for an unexpected dip on his way home! 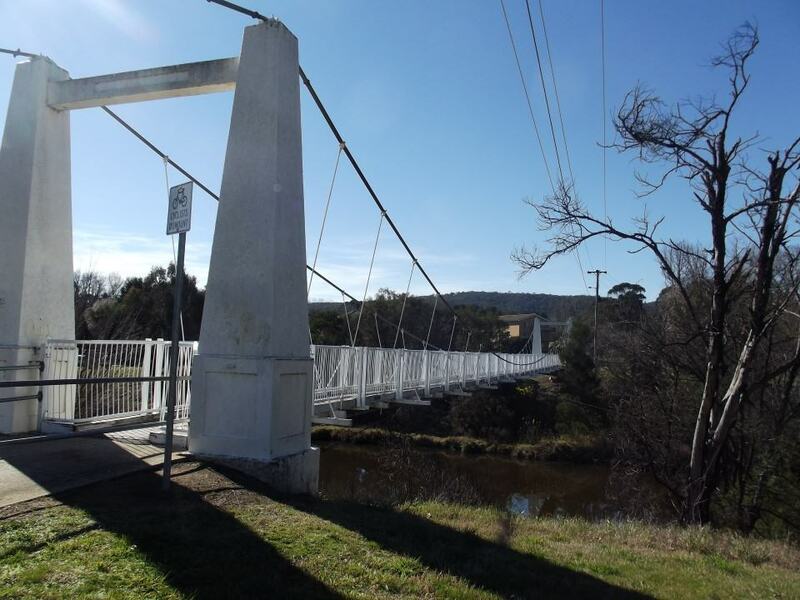 The bridge was washed away in the floods of 1925 and they were back to stepping stones until the current structure was completed in 1938.
quite a few of some distance, there’s bushwalking and birdwatching, sailing and fishing. 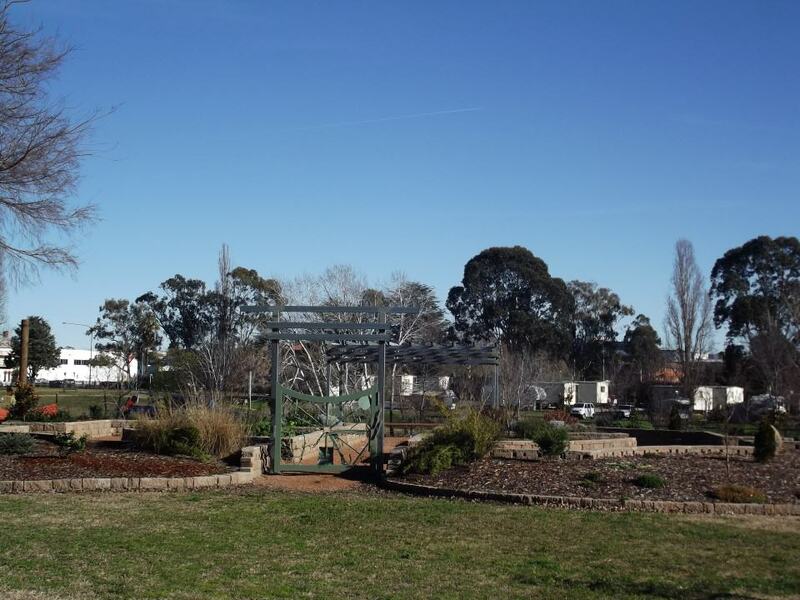 In fact, this is the perfect place for a family picnic with wood and gas barbecues in the picnic areas and plenty of open space for kids to play. 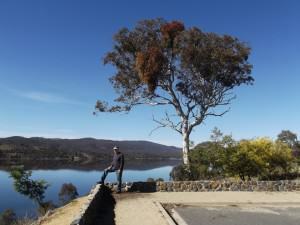 We went for a walk to the foreshore and to the Dam Wall Lookout along the Cascades Walk. The water was so still, there wasn’t even a ripple. The dam was completed in 1979 and at full capacity holds more than 121,000 megalitres of water. At the southern end of the dam is a rock formation called London Bridge. Spanning Burra Creek, this natural rock bridge has stood in its present configuration for over 20,000 years. I really wanted to go and have a look at that but it looked like I’d miss out this time. and there were one or two guys fishing. Don’t know if they were catching anything but, as I’ve said before, sometimes the art of fishing has very little to do with actually catching fish. Swimming is permitted but only in the Queanbeyan River below the dam wall. We had noticed a couple of hardy souls taking a dip when we were on our walk. Now, it was a lovely sunny day and somewhat warm-ish but it wasn’t THAT warm! Must have ice water in their veins, is all I can say! The sun was starting to go down and as it dropped so did the temperature and so we said goodbye to Googong Dam and made our way back to Queanbeyan. Our time here was at an end and we were heading out the next morning. But there’s much more to see and do in Queanbeyan than our short visit allowed and I hope we come back some day. I definitely want to see London Bridge and, who knows, I might even get John into that museum!